When the wonderful Shara White invited me over to Speculative Chic to talk about a few of my favorite things, I jumped at the chance. Read about my favorite movie villain on four wheels, underground music to write to, and my secret addiction to a retro gamebook series more than 60 books long. P.S. She’s doing a book giveaway, too! It’s all on Speculative Chic. … how writers deal with reviews, both good and bad? … what kind of mistakes beginning writers often make? … where writers get their ideas? I’m doing an Ask Me Anything (AMA) event on Wednesday, May 23 at 4:00 PM EDT. This is your chance to connect, ask questions, and see what other readers are wondering. Want to to get your question bumped to the front of the line? It’s open now. Go ahead, ask me a question. 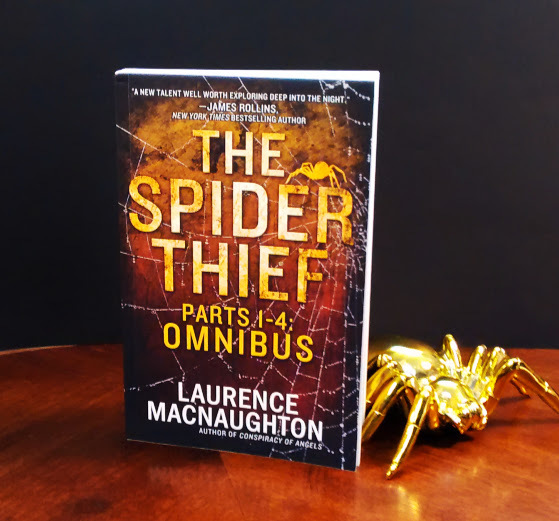 Win The Spider Thief paperback from IndieHouseBooks.com! 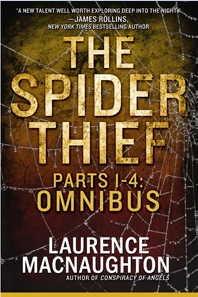 IndieHouseBooks.com: The Spider Thief begins with a con artist suffering amnesia. That’s an unusual choice for thriller. What made you want to write it? Who would kill for a gold spider– and why? Find out! Laurence MacNaughton: This might sound crazy, but it really happened. Not too far from where I live in Colorado, a local man disappeared without a trace. When they found his car abandoned in California with the keys still in it, they feared the worst. Then, a couple of weeks later, this guy woke up in the middle of the night, sitting on the sidewalk, holding a loaded gun. He had no memory of what had happened in the past 14 days . . .
Are you signed up to win more cool stuff through my author newsletter?